Raise your vehicle 6 inches effortlessly and instantly. Forged steel gears and shaft, and aluminum housing, are oil built for years of use. Built to last! 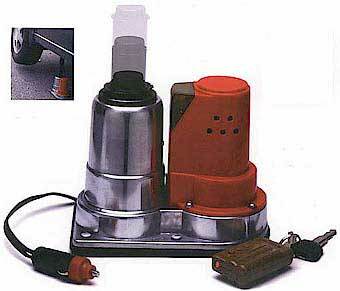 12 volt cigarette lighter plug with 12 foot extension cord to reach any area of your vehicle. One year parts and labor limited warranty. Infrared key chain remote saves hassles, keeps you off your knees, no grease no mess. Infrared light indicates unit is ready to work. Most incredibly it fits in your palm. Measuring just 7"x4"x5". Caution: As with any jack never go under your vehicle relying on the jack alone. Use blocks for under car repairs and always check your wheels. INCREDIBLE!!! Micro Super Car Jack! Simply plug it into your dash board cigarette lighter, point the infrared remote control, and presto the jack raises the vehicle effortlessly and your tire is changed in no time. Not to mention the other day to day uses from the garage to the construction site. Built for rugged use but made to fit any lifestyle. No worries, no complex iron bars, just peace of mind and safety for your loved ones.